It was that time of year again: Cali’s annual Morris Animal Foundation Cancer Study visit. Since she is a very healthy young golden retriever, and since we’ve been very lucky this year, she hadn’t been to the vet since her last checkup a year ago. The day got off to a rough start and went downhill from there. If I were tweeting it, I would hashtag it #PeeFail and #NailFail. Cali would tag it #NoBreakfast. She knew what was coming when I got up early and followed her outside carrying a paper plate. Uh oh. 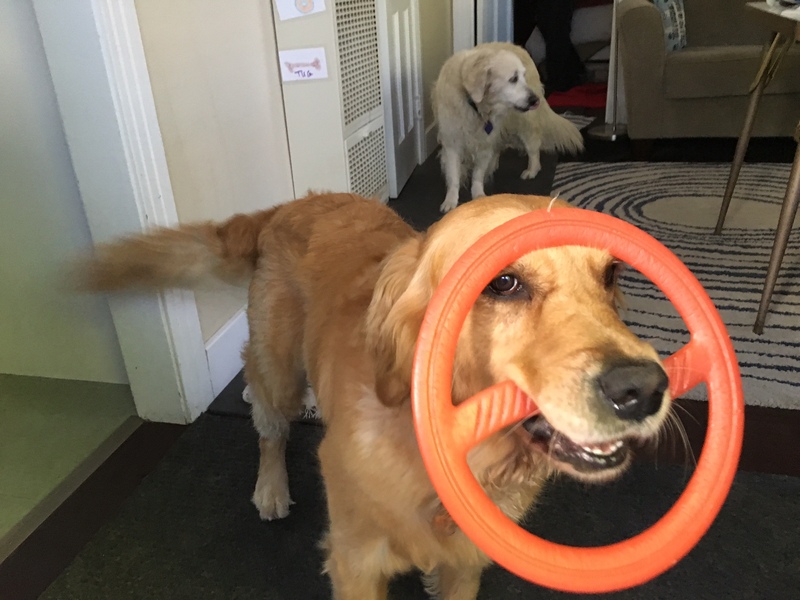 Cali’s worried look said that she remembered: When Mom chases her around the yard with a paper plate, the next thing that happens is … no breakfast. Cali hates the whole paper plate thing. She warily assumed the position. I put the plate in place. As soon as the plate came out, the pee stopped. I held tightly to the plate. Cali got up, giving me a disgusted look. Then, for good measure, she gave the plate a firm kick. “Take that, Mom. No pee for you.” The little I had managed to catch on the plate drained away. #PeeFail. After #NoBreakfast, I bundled Cali into the car and off we went. She was less-than-eager to follow her friend the vet tech to the exam room, though she brightened immediately when showered with attention and promises of cookies … after the blood sample was taken. Well. She hadn’t been there for 10 minutes when an emergency came in. Cali’s exam would have to wait. I left her with the clinic staff and made arrangements to pick her up in a couple of hours. The vet techs had better luck than I did in getting a urine sample, and the hair and blood samples were not at all challenging. They even remembered to give her a little snack. But the nails … this was a real problem. I don’t trim Cali’s nails very often. She hates it, as many dogs do. She also hardly ever needs it. She runs around and goes for multiple daily walks on concrete sidewalks that act as natural emery boards. I thought that maybe her dewclaws would be long enough to provide decent clippings, but even they were pretty short. Epic #NailFail. Cali and the Morris Animal Foundation were not having a good day. Finally, after a long, hungry morning at the vet, Cali was delighted to come home and play ball. After a late breakfast, of course. And a good, long pee. Why do we go through this every year? Cancer is a top killer of dogs, particularly golden retrievers. The study is following 3,000 golden retrievers throughout their lives, collecting the annual samples as well as large amounts of data. The annual questionnaire that I fill out documents everything that Cali eats and everyplace she spends more than a week. It tracks exposure to anything from secondhand smoke to cleaning products to pesticides. Each participant provides a three-generation pedigree as well. The study is examining genetics, environment and lifestyle to search for causes and triggers of cancer. This was Cali’s fourth checkup. I hope she has many, many more to come. And … maybe I just won’t trim her nails at all until the next one. It’s awesome that you’re participating in this study! Thank you!